When J. P. Morgan interests completed the formation of the International Mercantile Marine in 1903, Franklin served as a vice-president and director and in 1915, he was appointed receiver to the insolvent company. During the first World War Franklin served as the chairman of the Shipping Control Committee and, as such, was the supreme director of movements of all military cargoes during the crucial years of the conflict. 1915, New Jersey. 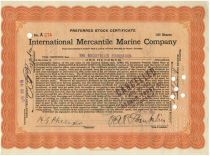 Stock certificate for the International Mercantile Marine Company and signed by P. A. S. FRANKLIN (1871 - 1939), as President. Issued to The Rockefeller Foundation. Orange/Black. Franklin was named Vice-President/Director of this company under J. P. Morgan and in 1915 became its receiver. Within a year he turned the company around and was appointed president. He was decorated with the distinguished service medal (US) for his contributions to World War I, involving the transport of all military cargo and control of their port of calls. During this time he was in charge of seven million deadweight tons involving 1400 ships, the largest fleet ever controlled by one man. For these reasons and his financial genius over the shipping industry, he rightly earned the title of "Dean of the Shipping Industry". Punch and stamp cancelled. Fine. 1931, New York. 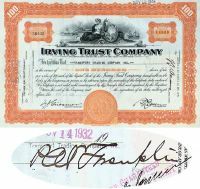 Stock certificate for 100 shares of the Irving Trust Company. Issued to the Transport Trading Company Inc. Signed on verso by P. A. S. FRANKLIN (1871 - 1939). Shipping executive, acknowledged as the "Dean of the shipping industry." When J. P. Morgan interests completed the formation of the International Mercantile Marine in 1903, Franklin served as a vice president and director and in 1915, he was appointed receiver to the insolvent company. During the first World War Franklin served as the chairman of the Shipping Control Committee and, as such, was the supreme director of movements of all military cargoes during the crucial years of the conflict. Perferation cancellations not affecting Franklin's bold signature. Fine.